2015 – plans and squad news! It’s been a long time since i’ve written a blog being as autumn has been all about moving house and trying to rest. That, and I’ve basically been a right old lazy thing doing the bare minimum of base training and having a good old recharge in-between packing and unpacking boxes! After a very bitter/sweet 2014 i’m now getting rather excited and revved up for the coming 2015 season. I have all my races planned and have a completely new focus to training this year. Last year for me, it was all about trying to get faster than my ironman debut year of 2013, and, if that was my only goal then I would say it was it was a pretty amazing year as I got significant PB’s at sprint, 70.3 and full ironman distance as well as 2 PB’s on 2 successive half marathons. However, I also wanted to put to bed some quibbles I had relating to health issues – and like lots of things in life, somethings have to get worse before they get better – and they certainly got worse last year! That said, i’ve had some really good advice and diagnoses this year and now I’m definitely on the up and looking forward to a year racing as the new healthier me! I am very pleased and proud to be racing next year in a new triathlon squad. For the last 18 months I have been coached by Musty Salih who has taken me from a non-swimmer in 2011 to racing IM distance in 2013 and qualifying for the 2014 ETU Long distance championships. 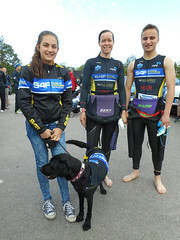 Musty’s coaching business, Strive4Fitness has launched a UK based triathlon squad for 2015 race season with athletes of all abilities racing from sprint to IM distance. 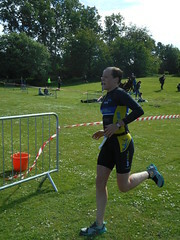 Musty is a Professional Triathlon Coach with over 15 years experience; Level 3 qualified with the Register of Exercise Professionals (REPS) along with a whole host of other personal training qualifications. As I’ve known and trained with Musty for several years now he knows exactly how my head is geared up and he can see what most athletes cant see in themselves – strengths and weaknesses that need addressing, focus and tweaking. He gives me the confidence to believe in myself and my abilities. In 2015 I will continue to race on my Azione Falce TT bike which I absolutely love and am still very grateful for the support that Azione provide me with. RaceRx in California have also helped me greatly with my nutritional needs and will continue to support me and I’m very much looking forward to racing fuelled by their products for another year. So what’s actually on the agenda then in my first year of racing with S4F triathlon squad?? Swim events, Half marathon & Marathon run races, Sprint distance, Olympic distance, Middle distance, and a full Ironman – so basically covering all bases! Throw in a couple of training camps in the Alps and the Welsh black mountains and it should be an action packed fun year. 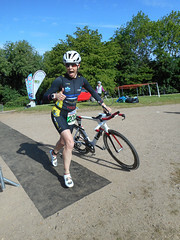 If you are interested in joining a supportive, fully coached triathlon squad, contact Musty at coachmusty.com for more info.